Three men who blew up cash machines - stealing almost £150,000 - have been jailed for a total of 53 years. Police said Joel Spears, Ermias Fekade and Stephen Fahri created uncontrolled gas explosions as they stole cash points from petrol stations and Post Offices in seven different towns and villages, including targeting a Post Office in Hurstpierpoint. The explosions caused more than £150,000 worth of damage to the machines and nearby buildings. In total the trio stole £148,250. 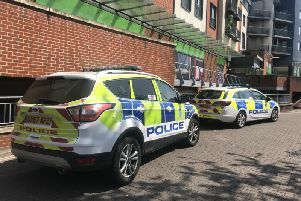 Police said Spears, 31, of Becket Close, Wimbledon, London, and Fekade, 36, of Moyne Close, Hove, were both found guilty of conspiracy to cause explosions and steal after a six-week trial at Croydon Crown Court. They were sentenced to 20 and 16 years respectively in prison while Fahri, 36, of Mayfield Crescent, Brighton, was given 17 years after pleading guilty to the same offence at an earlier date. The crooks hit ATMs at four different locations in Sussex. Police said £54,000 was stolen from the Post Office in High Street, Hurstpierpoint, after the ATM outside the front of the shop was blown up at 4am on March 23 last year. A cash machine was exploded and £20,000 was stolen at a Post Office in Shoreham while £33,000 and £5,000 were taken from ATMs at a Post Office in Saltdean and Bexhill train station respectively. Other places targeted included Esso garages in Bromley and Burnham, a Texaco in Reigate and another Post Office in Tunbridge Wells. Police said the men were caught following an investigation by the Met’s Flying Squad into a linked series of cash machine thefts between January and April 2017. Gas cylinders, electrical wire and a sledgehammer used in the incidents were found in a falsely registered Ford Mondeo estate parked up in Poynings. Officers added the gang also used high-powered stolen vehicles with stolen number plates and wore balaclavas to conceal their identities. Detectives linked the gang to the offences through CCTV, mobile phone records and forensic evidence. All three were arrested on April 20 last year after an attempt was made to explode a cash machine in Tunbridge Wells. The Flying Squad were assisted by Safercash, a not-for-profit intelligence-sharing initiative.